The Bronze Age in China (ca. 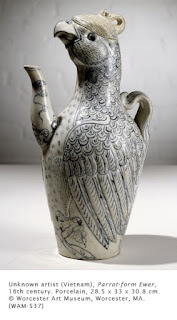 2000–200 bce) produced a large variety of vessels all with intricate incised and raised decoration. The kuei was originally a vessel of earthenware used to store wine or oil for the tomb, which later changed to bronze and was primarily used for ceremonial or symbolic purposes. During the mid to late Shang period, bronze vessels were symbols of status, power, and prestige. Some emperors used nine or ten kueis in a single ceremony while honoring ancestors. 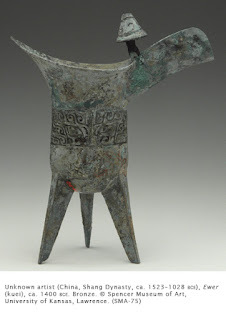 This is an example of a tripod vessel, which means it has three legs. On each corner of this triangular vessel is a raised taotie pattern. The taotie is an animal or dragon face that is split so that it is presented as two frontal views. Elaborate scroll work usually accompanies the design. 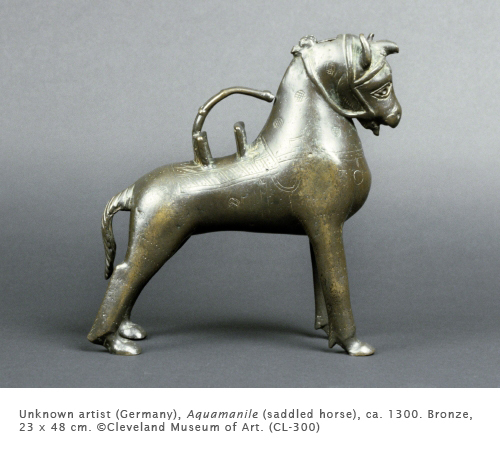 Chinese bronze were produced from sectional molds built around a model. The interior of the molds bore the incised or raised decoration. The space between the mold and the model took the molten bronze to form the vessel. The Aquamanile derives from ancient Roman times. “Aqua” means water in Latin and “manile” comes from “manus” for hands. The vessel was used at dinner tables for guests to wash their hands between courses. The tradition continued in Europe during the Middle Ages (ca. 1000–1400), among the upper classes, particularly in Germany (German rulers considered themselves descendants of the Roman Empire (ca. 27 bce–535 ce). The vessel has a hinged lid on the horse’s forelock, and the water spout is the mouth. This horse is most likely a secular object. The aquamanile also evolved into a liturgical object in the medieval church. The vessel was used during the mass for washing the priest’s hands. Although China dominated ceramic styles in Asia and Southeast Asia for centuries, Vietnam managed to develop its own distinctive styles. Ceramics kilns date back 2000 years, but the oldest persistent style dates to the 11th through the 15th centuries. 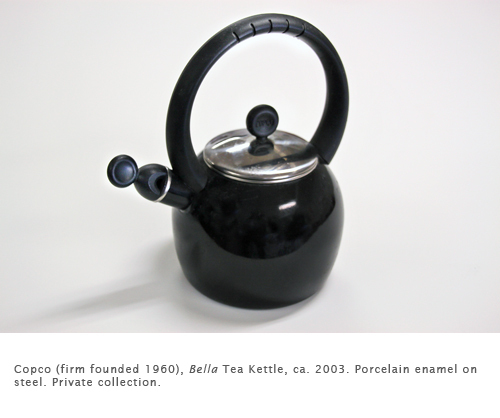 It consisted of incised, iron (brown) glazed decoration on stoneware. Such wares were exported as far as the Philippines and Indonesia. Starting in the southern Song dynasty in China (1127–1279) there was extensive export of porcelain to other parts of Asia, and hence an increase in Chinese influence in Vietnamese wares. Porcelain became a strong export item for Vietnam starting in the 14th century. Like Chinese porcelain of the time, many Vietnamese wares have a cobalt blue underpainted design (which sometimes appears charcoal grey). This ewer is comparable to Korean examples from the same period. Earl Tupper formed the Earl S. Tupper Company in 1938 to design and engineer industrial plastics. He garnered several military contracts during World War II. 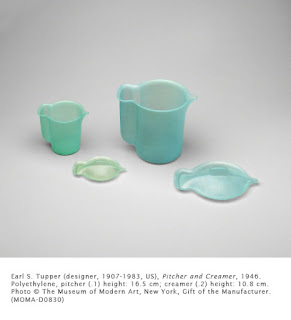 After the war, Tupper turned his attention to plastic products for the consumer market. In the 1940s, plastic was still in its infancy. The commercial market for plastic products was limited by the common perception that plastic (a petroleum-based product) was smelly, greasy, and brittle. Tupper developed a method for purifying polyethylene slag, a waste produced by oil refinement, into a plastic that was flexible, tough, non-porous, non-greasy, and translucent. Then he developed an airtight lid based on the design of paint can lids. Together these innovations were the foundation for Tupperware. Retail sales of Tupperware initially failed, apparently because the new lid needed demonstration. Based on the Stanley Home Products model of house parties, the Tupperware party was born and remains to this day the exclusive outlet for Tupperware. The beauty of enhancing our creativity is that we can learn to look at the world in a different perspective. Being creative is not only about art or music. It’s the way we approach life. There aren't words to describe how much I adore these!!! !